A Composer At The Edge Of Sound Tod Machover's goal is to put music into the hands of people who want to play it — or at least imagine it. He and his team at MIT helped to create Guitar Hero, and one of his latest projects helps people with disabilities write and perform music. 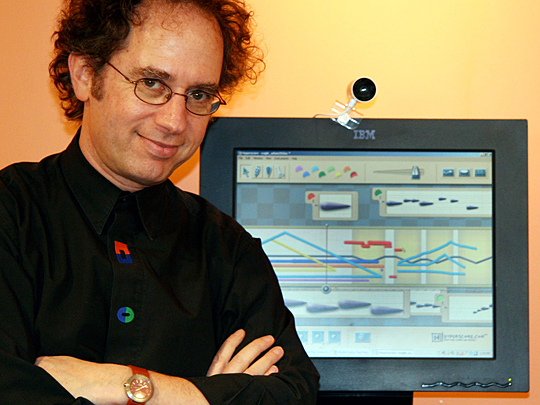 Tod Machover, with a demonstration of his Hyperscore software. Hear an NPR story from 1990 about one of Tod Machover's earlier compositions. 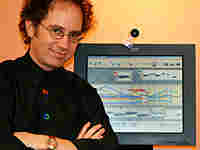 Tod Machover's goal is to put music into the hands of people who want to play it — or at least imagine it. Video game fans may have spent some time with something Machover and his team at the Massachusetts Institute of Technology helped to develop — Guitar Hero. In the early 1980s, Machover was director of musical research at IRCAM, a music research institute. Since 1985, the American musician and composer has been at the forefront of music and technology as a professor at the MIT Media Lab in Cambridge, Mass. Machover says a lot has changed since his days at IRCAM: Now, anyone can access cutting-edge technology. "The idea that you could make a new kind of instrument that would use the gestures you were most natural and familiar with, and the fact that that would lead to a set of instruments that would let anyone have fun with music makes a lot of sense," he says. Machover first began working on what he calls "hyperinstruments" at MIT in 1986. The most famous is probably the hypercello he created for Yo-Yo Ma. "The basic idea of a hyperinstrument is where the technology is built right into the instrument so that the instrument knows how it's being played — literally what the expression is, what the meaning is, what the direction of the music is," Machover says. "If a performer pushed to a downbeat or relaxed on a phrase or brought out a particular F-sharp, those things would be recognized and valued by the instrument." For Yo-Yo Ma's hypercello, Machover placed sensors on the instrument, the performer's wrist and his bow and fed the electronic impulses generated by those sensors into a computer. It took the signals and responded to the cellist's playing — sometimes transforming the sound, and sometimes creating new sounds. Machover is a cellist himself. He started playing as a child, and from the beginning he was interested in modern classical music — and rock. He studied at the University of California, Santa Cruz, and at Columbia and the Juilliard School of Music in New York — where his mentors included the late Roger Sessions and Elliott Carter, who is still composing and will celebrate his 100th birthday next month. Machover admits his approach to music isn't for everyone. He hopes his hyperinstruments will be adopted by more soloists. But he says at least one school has seized on the idea. "The Royal Academy of Music in London got interested in hyperinstruments and particularly in stringed hyperinstruments," Machover says. "So we've worked with them for the past few years to bring a set of these instruments into the center of their curriculum. And that's a wonderful way for these kinds of instruments to get into [the hands of] soloists, chamber musicians and orchestras." "Music, Mind and Health" is the name of one of Machover's latest projects. He and his team at the MIT Media Lab were contacted by the Massachusetts Cultural Council to see if they were interested in working at a hospital in Tewksbury, north of Boston. "Our initial work was with people who were long-term residents at this hospital and, generally, people with no experience in music," Machover says. One person Machover's team worked with was Dan Ellsey, a man in his early 30s with severe cerebral palsy. Bound to a wheelchair, Ellsey has very limited movement, and communicates with a talking box that he controls through an infrared controller worn in a headband. "One of my students made an interface so Dan [Ellsey] could use his head movements and the infrared controller on his head to actually draw the lines and colors that we use for our Hyperscore software. He wrote a piece that was transcribed for symphony orchestra and is absolutely dynamite." 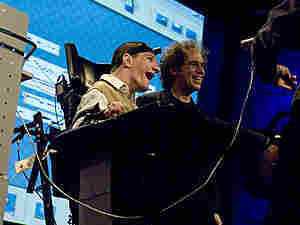 Machover's student used the same controller on the young man's head to create a hyperinstrument that understands the movements he can make and compensates for movements that are difficult for him. "He changes the sound of the piece; he changes the emphasis; he changes the texture; he changes the accents; he changes the color of the piece," Machover says. "When he's playing the piece, he's a different person." Machover does all of this work — his research, teaching and outreach — while still pursuing an active career as a composer. His work has been commissioned or performed by Pierre Boulez's Ensemble Intercontemporain, the London Sinfonietta, Speculum Musicae, the San Francisco Symphony, Houston Grand Opera, Kronos Quartet, Yo-Yo Ma and others. He has written or edited four books; seen two operas premiered; and composed more than 25 orchestral, chamber and electronic works. Two new operas will premiere in the next few months. So, what about Guitar Hero? Machover sees in it the future of music. "Imagine if [Guitar Hero] were truly expressive, truly personal, truly creative. The wonderful thing about Guitar Hero is that it opens up the door for everybody to be not just a passive listener but a real active participant in music," Machover says. "I think that is the future of music: music that is a collaboration between what we traditionally think of as composers and performers and the audience."